One way to quickly build up a stash of frequent flyer miles is to take advantage of limited-time offers the airlines promote. Oftentimes, airlines like Avianca and banks like American Express will offer a bonus scheme when you transfer miles between accounts. That means you may earn a bonus when you transfer your miles to your husband’s account, or to a friend or child. Sometimes the deals aren’t worth it but when they are, you can leverage the promotion to earn plenty of free travel for yourself and potentially others. Let’s look at this method of earning loyalty currency. There are a few different ways airlines, banks, and hotel loyalty programs offer transfer bonuses. American Express Membership Rewards points can generally be transferred to a select group of airline frequent flyer programs at a ratio of 1,000:1,000. In the past, Amex has offered a variety of incentive bonuses in which they give you some extra miles when you transfer Membership Rewards points to a specific airline. Look for the “Offer” logo at the Membership Rewards website to find out if there are any bonus promotions running. One of the most recent transfer bonus offers ended on December 31, 2016, and was for transfers to Alitalia’s Millemiglia program. The normal transfer rate is 1,000 Membership Rewards points for 1,000 Alitalia miles. During this promotion, American Express offered a 40 percent bonus. So, for every 1,000 Membership Rewards points you transferred, you received 1,400 Alitalia miles. Also ending on December 31 was a bonus transfer from Amex MRs to Iberia Plus. 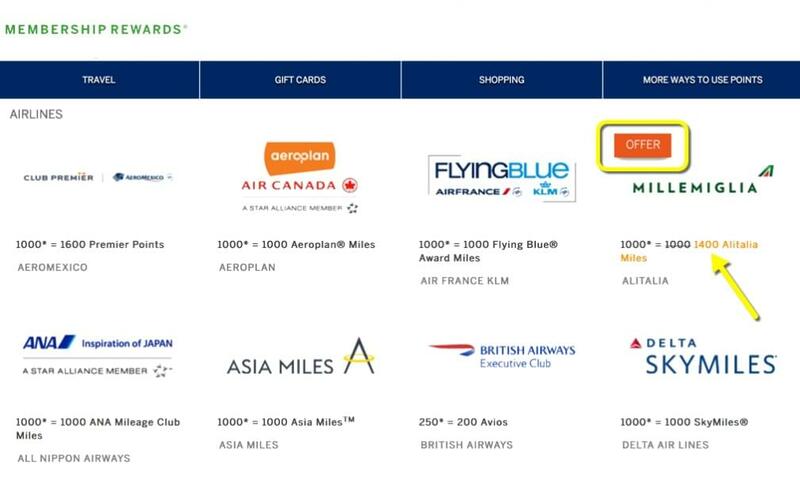 Normally, 250 Membership Rewards points equals just 200 Avios (since Iberia is a British Airways partner). With the bonus, those same 250 Membership Rewards points would be worth 300 Avios. Oftentimes, airlines will offer a bonus when you transfer miles between your account and someone else’s. While this may initially seem strange, it can be a fantastic way to bump up the balances in your friends’ and family’s accounts. The bonus can work like this: You transfer X number of miles from your account to someone else and you’ll receive a bonus of X percent. Or, the promotion may work differently. Sometimes when you transfer miles from your account to someone else’s, the airline also tops off that person’s account with a bonus of X percent. You’ll need to carefully read the terms and calculate the fees to determine if a transfer makes sense for you: with or without the bonus. Some of these bonuses can be especially lucrative but there can be a catch or two. For one thing, the terms of these promotions usually state that your frequent flyer account—and the one you’ll transfer miles in to—have to have been open for a certain amount of time. Also, there is usually a cap to the number of miles you can transfer per calendar year. For example, Avianca LifeMiles only lets you transfer 75,000 miles per calendar year. Be sure to read the terms of service for all transfer deals before pulling the trigger. Avianca LifeMiles: 100 percent transfer bonus (meaning, if you transfer 75,000 miles, your recipient will receive 150,000) Note: To make the most out of these types of offers, you need to have some miles in your account already. In the case of Avianca, they often also offer lucrative bonuses for purchasing miles so it may be in your interest to purchase miles during one promotion and then transfer them to someone else in the next promotion in order to generate the most miles possible. The best way to learn about these transfer offers is to sign up to receive emails from your frequently flyer, hotel loyalty, and bank programs. Scan the offers as they arrive in your inbox to determine if it’s something that may help you achieve one of your travel goals.